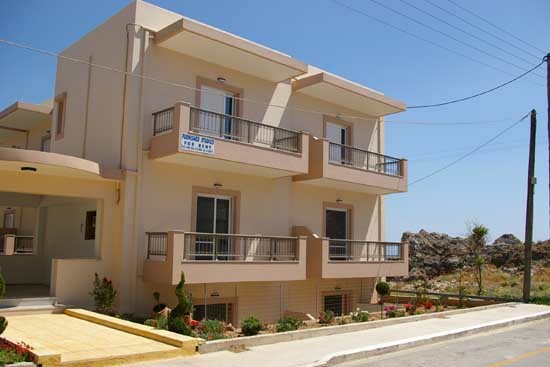 Jannis "Extraprima" welcomes you in his nice and quiet Hotel on the southeast end of town, overlooking the Libyan Sea. Supported by his family, consisting of Anna, Joanna and Nikos, he offers comfortable studios with all conceivable technical equipment, including fully equipped kitchen, airconditioning and a special door construction, that keeps the mosquitos away but lets the breeze come in (if you want). Extra beds are available, as well as service for groups up to 25 people.